very sad news, thanks Simone. heartbreakingly sad. I found the images on the news traumatic to watch. Some people were trying to help some struggling animals but the waters were too treacherous. How tragic this whole thing is. Noted. 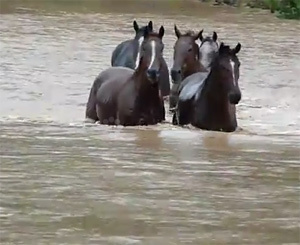 My prayers are with all the people of Australia and all the horses and animals. The RSPCA is desperate for donations, and organizations like IFAW and WSPA are probably helping as well. Thanks for posting. This is so very heartbreaking, tears down for those helpless creatures, my thoughts & pray for all the living creatures suffering as the effect from the flooding, i hope there will be no more victims and the disaster will be ended soon. Sadly noted, thanks for posting Simone. God Bless.